Bitcoin’s (BTC) long-awaited breach above the formerly elusive $4,000 price position was actually expected to give a major boost to the remaining cryptocurrency market. Ahead of the BTC halving, in light of BTC ETF, Tom Lee and Tip Draper BTC price analysis, Bitcoin has started recovering against USD. The $4,000 support is very strong at present and BTC is moving towards $4,100 resistance. If successfully cross, it is going to advance to $5,500 by May and lead to a bull rally. So how can we take good advantage of the price fluctuation and maximize profits before the next bullish market? In the traditional BTC spot trading, traders often sit on the sidelines until a trend emerges, missing any opportunity for profits, without choosing clear direction. However, with BTC futures trading, also called margin trading, even a small price rising or falling can bring you enormous profits. Bexplus is one of the world-leading futures exchange in cryptocurrency area. Bexplus offers 100x leverage across all major trading pairs including BTC/USD, ETH/USD and LTC/USD on the platform. With 100x leverage, traders can open a “short” or a “long” position of 100 BTC with only 1 BTC used as margin. If BTC price increases or decreases 10%, the profit would be 10 BTC, whereas without leverage, the profit would just be 0.1 BTC. Although BTC futures trading can help trader amplify greater profits even with small capital allocation, it will also be risky if traders don’t understand how to trade futures contracts well. In order to help trader know more about futures trading, Bexplus provides trading simulator to users and they can try to trade BTC futures contracts with 10 FREE BTC. Besides, users can also set stop-profit and stop-loss to lower the risks and guarantee the profits. Bexplus’s Demand Deposit provides investors secure BTC wallets to save their bitcoins (any amount they want) as the normal banking account. The interest will start to be calculated as soon as you deposited BTC in. Annualized interest rate will have chance to be up to 72% according to the deposit amount. You can also use the BTC in the wallet to trade futures contracts freely without affecting the interest calculation. For example, if you deposit 10 BTC for a year, you will receive 10*72%= 7.2 BTC annualized interest. Note: The profit you earned from futures trading in Bexplus will also be calculated interest. For example, if your invitees’ total deposit is 10 BTC, you may have chance to earn 5 BTC. Up to 100% FREE BTC bonus will be sent to clients who deposit and trade futures contracts in Bexplus. For example, deposit 10 BTC, you will get 20 BTC credited in your account. Bexplus proves that traders have no need to wait for the bull market to earn money, but utilize 100x leverage futures trading to make great profits no matter in bear or bull run. 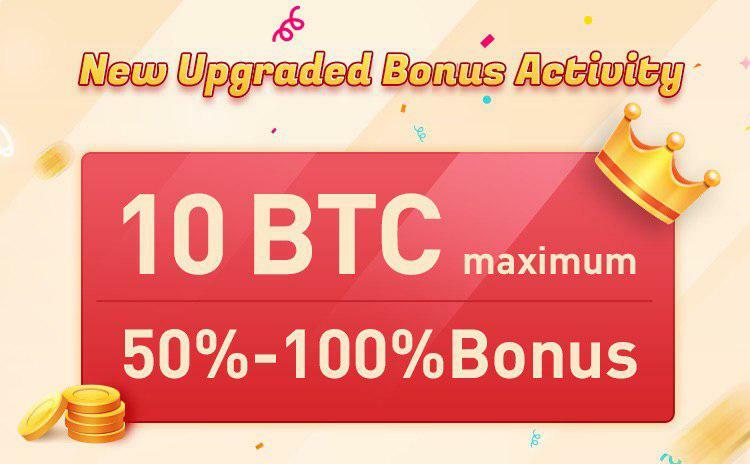 For conservative investors, you can also earn BTC by joining Bexplus’s saving account, referral rewards or 100% deposit bonus activity.